I’m assuming that you’re asking about the meaning of the word ‘sapnu puas’ or any translation of these two words. If you’re updated with social media sites and online dating apps, I’m sure you already read these lines posted by someone via status, text and memes. The fact that you’re reading this post, I also assume you want where the word came from and what it is all about. If you’re thinking that these words are not English and trying to translate it to Spanish, Tagalog, Indonesian, Arabic and other language, I’m sure you cannot get the right answer by just translating it. 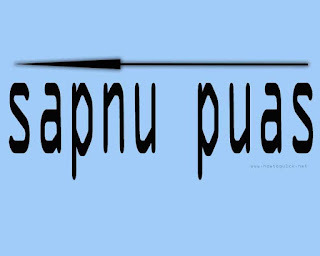 The definition of ‘sapnu puas’ is simply ‘send nudes’. If you’re wondering how did that happen or where did it came from, you can use the image above to reveal the creativity of the word. All you have you do is open or zoom the word in the image the read it upside down. If you’re using a smartphone or tablet, you can quickly turn your phone upside down to read the word. For computer and laptop users you can download the above image, then edit it by rotating the photo twice using Windows photo viewer or even Photoshop.